The energy efficiency of insulation is most commonly measured by its R-value. R-value refers to the ability of a given material to resist thermal transfer. The higher the R-value, the more resistant the material is, the less energy you use, and the lower your energy bills. Is R-value Consistent Over Time? When selecting an insulation product, it is important to recognize that there is an individual R-value of the material, such as a roll of fiberglass batt or a SIP panel. Then, there is the R-value of a whole wall or roof once the product is actually installed (effective R-value). Most manufacturers list the individual R-value of their insulation products. This R-value represents the R-value of that piece at the time of installation under ideal conditions. For instance, if you purchase a roll of R-19 fiberglass insulation, that number refers to the best possible R-value offered by that roll of insulation. However, once the batt is installed, the value starts to go down immediately. Fiberglass insulation works in tandem with air, so any compression of the batt will reduce its effectiveness. The width of R-19 batt is listed as 6¼-inches. It is recommended for use with a 2″ x 6″ stud wall. However, 2″ x 6″ studs actually come in a nominal size of about 5½-inches. 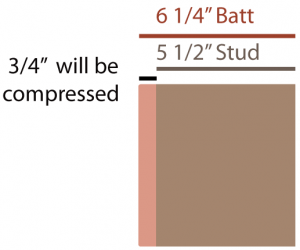 Since the studs have a width that is ¾” smaller than the batt, the installation of the drywall compresses the batt insulation in the wall cavity. This reduces the air in the batt, and subsequently, the R-value. Jump below to see the initial R-values of Insulspan SIPs. This will provide a starting point for comparing our thermal resistances. The insulation value can be further diminished by poor installation techniques. Excessive compression of batt, poor mixing of spray foam, and gaps left between studs are common issues. Choosing to use Insulspan EPS panels practically eliminates the chance of diminishing the R-value during installation since the expanded polystyrene (EPS) insulation is continuously laminated to both sheets of oriented strand boards (OSB). When we take the construction of the whole wall into account, this is called the “effective R-value.” Let’s look at a section of wall that includes the insulation and the surrounding 2″ x 4″ or 2″ x 6″ studs of traditional stick frame constructed home. Thermal bridges are located anywhere the insulation is interrupted in a wall or roof system. Studs are thermal bridges, and in a stick-framed home, they occur every 16″ or 24″ on center. Thus, the effective R-value of a 2″ x 6″ wall, with all its thermal breaks, is about 6.88, which is substantially below that of the standalone R-value of the insulation pocketed between the studs. Lumber is still used to connect EPS SIP Panels to each other. However, Insulspan manufacturers structural insulated panels in sizes up to 8′ x 24′. As a result, there are far fewer thermal bridges in an Insulspan SIP building than in a conventionally-build stick frame home. Once an EPS SIP structure is complete, the effective R-value will remain constant over time. This is not the case with other insulation products. The R-value of a wall diminishes when batting falls over time due to gravity. Spray foams that use a thermal resistant material as its blowing agent will off-gas that agent, losing much of that added insulating value, within 5 years. Learn more about Effective Thermal Resistance in PIB 209. While the R-value of a material measures the thermal resistance, the U-factor (U-value) measures the rate of thermal transmittance through a material. Thermal transmittance takes heat transfer due to conduction, convection, and radiation into account. For instance, the energy efficiency of a window is commonly listed by U-value because the configuration of a window needs to address all three methods of transmission: conduction of energy through materials such as the glass or casing, convection through any unsealed parts of the window, and radiation (from the sun) through the glazing applied to the windows.